Lodger is the thirteenth studio album,released in 1979. The last of the ‘Berlin Trilogy’ recorded in collaboration with Brian Eno, it was produced in Switzerland and New York City, and was more accessible than its immediate predecessors Low and “Heroes”, having no instrumentals and being somewhat lighter and more pop-oriented. 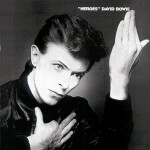 It was still an experimental record in many ways and was not, by Bowie’s standards, a major commercial success. 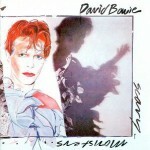 Indifferently received by critics on its initial release, it is now widely considered, along with Diamond Dogs, to be one of Bowie’s most underrated albums. All lyrics written by David Bowie; all music composed by Bowie and Brian Eno, except where noted. 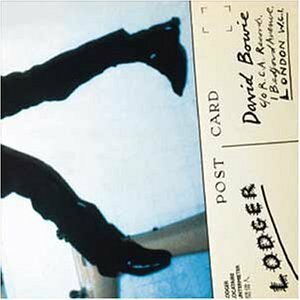 Lodger has been re-released several times on CD. RCA first issued the album on CD in 1985. 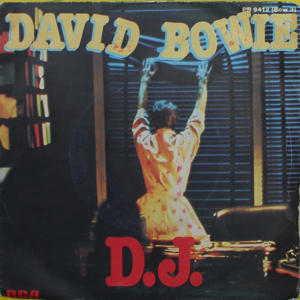 Rykodisc (in the USA) and EMI (elsewhere) released a version with two bonus tracks in 1991. The most recent iteration appeared in 1999 on EMI (featuring 24-bit digitally remastered sound and no bonus tracks); subsequent editions are merely repackagings of the current EMI edition. UNCUT: Lodger is an album which really divides Bowie fans – it is either devout love or total indifference. Can you understand both reactions? DB: I think Tony and I would both agree that we didn’t take enough care mixing. This had a lot to do with my being distracted by personal events in my life and I think Tony lost heart a little because it never came together as easily as both Low and Heroes had. I would still maintain though that there are a number of really important ideas on Lodger. If I had more e time I would explore them for you…but…you can probably pick them out as easily. UNCUT: Moving away from pure electronic sounds – was this a deliberate strategy to stay ahead of the synthesizercopycat bands who were busy aping Low and “Heroes”? DB: I think it’s the lack of instrumentals that give you the impression that our process was different. It really wasn’t though. It was a lot more mischievous though. Brian and I did play a number of ‘art pranks’ on the band. They really didn’t go down too well though. Especially with Carlos who tends to be quite ‘grand’. UNCUT: Was the backwards tape of All The Young Dudes for Move On originally an accident? And does this song have any connection to the unfinished Iggy collaboration Moving On? DB: Not really an accident but I did stumble upon it. I had put one of my reel to reel tapes on backwards by mistake and really quite liked the melody it created. So I played quite a few more in this fashion and chose five or six that were really quite compelling. Dudes was the only one to make the album, as I didn’t want to abandon the ‘normal’ writing I was doing completely. But it was a worthwhile exercise in my mind. It has the same title as the song I wrote for Iggy. But as the one for Jim was a working title, I passed it onto the Lodger song. UNCUT: The final refrain in Red Money – “project cancelled”. Is this significant? A curtain being drawn on the Eno triptych? DB: Not at all. Mere whimsy. UNCUT: What is ‘cricket menace’? DB: Little crickety sounds that Brian produced from a combination of my drum machine ( I would and still do, use one to write with when I’m on my own) and his ‘briefcase’ synth. You can hear them on African Nightflight . 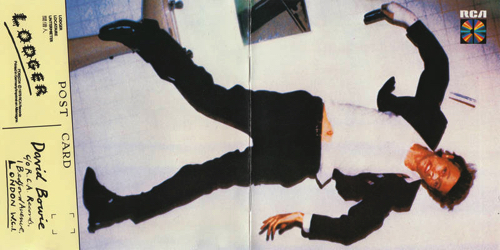 UNCUT: Lodger is an album which really divides Bowie fans – i.e. either devout love or total indifference. With hindsight, does it deserve? both these extremes? TV: I wished it was sonically better, the studios we used were poor choices, but the content of that album is wonderful. I play it a lot despite how bad it sounds to me. UNCUT: Moving away from pure electronic sounds – was this a deliberate strategy to stay ahead of the synthesizer copycat bands who were busy aping Low and “Heroes”? TV: I guess so. We didn’t do an ambient side on this one either. UNCUT: What about the “Planned Accidents” strategy (for example, Adrian Belew being put in the studio and told to play whatever came into his head over unknown tracks)? TV: A lot more chaos was intended. Brian was doing some strange experiments like writing his eight favorite chords on a black board and asking the rhythm section to “play something funky.” Then he would randomly point at a chord and the band had to follow. This didn’t go down too well, but we were trying all sorts of different things. Yassisin was a deliberate attempt to make a hybrid form of music – Reggae/Turkish. Fantastic Voyage and Boys Keep Swinging are the same song harmonically and structurally, as well as a third track that was never used. Adrian Belew was a champion because he’d do whatever strange thing that was requested of him. UNCUT: Eno’s credited as adding ‘cricket menace’. Please explain? UNCUT: Was the recording of Boys Keep Swinging based on Oblique Strategy cards (‘Change instruments’ and / or ‘Use unqualified people’)? TV: Probably. Fortunately Carlos could play good drums. TV: I have no idea. Ask David. 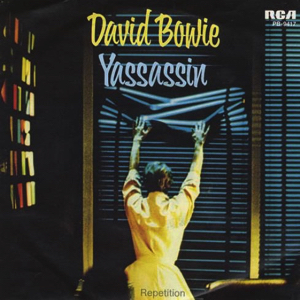 Single ‘Yassassin’ (1979) Only in the Netherlands and Turkey. I Pray Ole written by David Bowie. The final of the Berlin albums. Note the juxtaposition of performers on the various tracks, particularly Boys Keep Swinging where Carlos plays drums and Dennis plays bass.